Assassin Snails (Clea helena) are a colorful, carnivorous, freshwater species that is found throughout Southeast Asia; primarily Thailand, Malaysia, and (Lake Toba) the Indonesian island Sumatra. Assassin Snails are tolerant of a wide range of water conditions. They are efficient opportunistic carnivores that as their name implies, feed on live prey and scavenged detritus. In their natural habitat they can be found in lakes, pools, ponds, and ditches, but they prefer faster flowing streams with a sandy or muddy substrate where they remain partially hidden under the sediment to ambush their prey. Assassin Snails are not very active during daylight hours and will spend much of their time buried under the substrate until they sense a snail gliding past their lair. When they sense a snail they will quickly become active, chase it down and devour it. 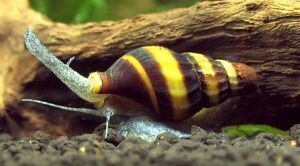 Assassin Snails have a conical shell that is attractively colored with dark chocolate brown and yellow bands. They have an operculum, and depending on the amount of food available, can grow up to 1 1/4″ in length. They are NOT hermaphroditic, but because males and females are identical in size and shape, sexing is next to impossible. In an aquarium environment, many tropical fish keeping enthusiasts find Assassin Snails extremely effective in reducing nuisance snail populations, and as long as water conditions are right and there is a plentiful food supply, they are relatively easy to keep. They need good water quality, regular water changes, are susceptible to high Ammonia and Nitrite levels, and like other snails are intolerant of copper in even minute amounts. Clea helena are definitely an eye catching addition to almost any planted aquarium and pose no threat to any other fish or shrimp housed in a community tank. They will spend the majority of their time buried in the substrate, but when another snail passes by, they will quickly become animated and emerge to prey on it. In short, Clea helena is a peaceful community tank resident that ignores fish, fry, shrimp, etc. but is devastating to nuisance snail populations. If you have a large tank with an explosion of existing snails, consider adding about 5 Assassin Snails for every 15 gallons of tank space to eliminate the problem however, remember that these snails are indiscriminate hunters and will take out good and bad snails in your aquarium. Assassin Snails have been successfully bred in an aquarium environment. Although identification of the sexes is currently impossible, placing several snails together will eventually find a male and female locked together. When this occurs, remove them to another tank where they will remain coupled for several hours. The female will lay several square shaped egg capsules around 1 mm in height and width on the glass, plastic, or on the base of plants in the tank. The eggs will hatch out within three weeks and the fry will disappear into the substrate. Clea helena are fond of eating Malaysian Trumpet Snails, Ramshorn Snails, and Pond Snails. When snail populations in the tank become depleted, they require additional snails but will feed on fish flakes, grindal worms , bloodworms , and other protein rich supplements. 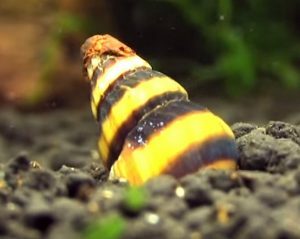 Assassin Snails are scavengers and will also accept dead fish or other meaty debris introduced into the tank, but care should be taken to avoid Ammonia and Nitrite spikes. Assassin Snails are available in tropical fish keeping shops and online at an approximate purchase size of 1/2″ to 1″ at reasonable prices. Well fed adults can grow to over 3 inches in length.